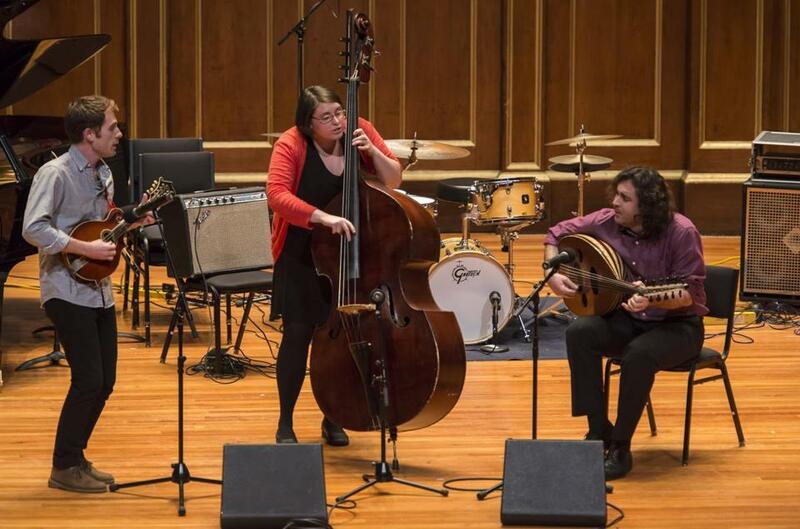 Dylan McKinstry (left), Kirsten Lamb, and Kinan Idnawi play John Zorn’s “Yesod” at Jordan Hall on Tuesday. From his emergence as a chief architect of New York City’s downtown avant-garde during the late 1970s and early ’80s, the composer, saxophonist, and bandleader John Zorn cultivated a reputation as a maverick bent on overturning orthodoxies. His idiosyncratic oeuvre proposes an alchemical wedding of rigorous traditions and pop ephemera: postbop jazz, free improvisation, modernist chamber music, grindcore metal, easy-listening exotica, and more. Now, at 61, Zorn finds himself in the curious position of accepting the enthusiastic embrace of mainstream cultural institutions the likes of which he once appeared to shun. On Tuesday night, a 35-year career retrospective concert mounted by the New England Conservatory of Music at Jordan Hall began with the once-unimaginable sight of Zorn graciously accepting an honorary doctorate conferred by conservatory president Tony Woodcock. Outlier status notwithstanding, Zorn surrounded himself from the start with brilliant, sympathetic musicians: a point he underscored repeatedly during a characteristically rumbustious preconcert Q&A session with Hankus Netsky, chairman of the conservatory’s contemporary improvisation program, and Anthony Coleman, a faculty member and one of Zorn’s most enduring musical comrades. That Zorn has drawn inspiration from the specific musicians who would play his music is hardly a new phenomenon: Think of Brahms, inspired by Richard Mühlfeld to create sublime clarinet pieces, or of Duke Ellington, who tailored bespoke charts for his individual bandsmen. Both instances produced works that survived their creators; Tuesday’s concert, performed almost entirely by NEC students, proposed that Zorn’s music is similarly suited to canonization. Unsurprisingly, his recent chamber-music scores were avidly embraced by practiced interpreters. The pianist Sarah Bob expertly navigated the Messiaen-meets-Cecil Taylor whorls of “Tender Buttons” (2014), with alert, airy improvised accompaniment from bassist Kirsten Lamb and drummer Eli Rojas. Student groups showed poise in selections from Zorn’s luminous “Madrigals, Book II” (2014), and in a movement from the skittish 2012 string trio “All Hallows Eve,” during which the violist Alexandra Simpson endured a broken string and renegade chin rest without blinking. Elizabeth England’s plummy English horn and Shaoai Ashley Zhang’s nimble piano abetted an invigorating Callithumpian Consort account of the fantastical, episodic “The Temptations of St. Anthony” (2012). Performers tasked with Zorn’s more idiosyncratic creations arguably faced the greater challenge. An account of the jumpy 1988 Naked City piece “Saigon Pickup” was skillful and efficient, but landed well shy of the original band’s swagger. That quality, substantial and essential, emerged from some of the same performers during an explosive “Warlock” (2009), ignited by Lautaro Mantilla’s stagey whispers and manic glossolalia. A trio of Lamb (whose versatility and assurance will someday spark a bidding war), oud player Kinan Idnawi, and mandolinist Dylan McKinstry effected a sublime transformation of the klezmer-infused “Yesod” (1996). And two pieces with rules and strategies adopted from games — “Hockey” (1978) and “Cobra” (1984) — proved ideal crucibles for Zorn’s febrile spark and its newest bearers.